SkyConnect, Rental Car Center are open for business! (February 15, 2018) Eduardo Garrido hopped off the SkyConnect at the Main Terminal station, luggage and family behind him, and immediately spotted a large bouquet of red roses. In one swift motion, he plucked a long stem roses out of the basket and smoothly handed it to his wife with a smile and a kiss. “Happy Valentine’s Day,” he said. He then gave a rose to each of his four daughters. “Thank you, you really helped me out,” he said to the Tampa International Airport team handing out roses. It was a big day for him – and, of course, for TPA. 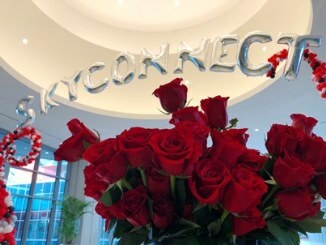 In the wee hours of the morning on Valentine’s Day, Tampa International Airport officially opened the new SkyConnect system and Rental Car Center to the public – the two largest components TPA’s expansion. The facilities were met with positive reviews on everything from the new modern space to the SkyConnect interiors and the new Remote Bag Check. Covering 1.5 miles of track, the SkyConnect takes passengers to and from the Rental Car Center with a stop at the Economy Garage. One of the six trains arrive at each stop roughly every two minutes. From one end to the other, the entire trip takes less than five minutes. Rental car customers now have access to twice as many rental car brands and getting to and from the Economy Garage is now a convenient train ride away. Lenore Silverman, in town on vacation from Newark, NJ, said she had a great experience on the SkyConnect and at the new Rental Car Center. She especially liked the remote bag check. “I have never had an experience like that before – that’s great,” she said. Passengers, like Bruce Sing and his wife, who were in town from Indianapolis, admired the new facility. The two arrived extra early on Valentine’s Day to return their rental car. “It seemed it was well prepared and well lit,” he said, adding that it was a nice upgrade from the previous rental car facility.